A lot of people have probably never heard of Alexander Pfister before. He might not be well known to a lot of people, but he has pretty strong resume in the board game community. His resume includes games like Broom Service (2015 Kennerspiel Des Jahres Winner), Great Western Trail (2017 Kennerspiel Des Jahres Nominee), Isle of Skye: From Chieftain to King (2016 Kennerspiel Des Jahres Winner), Mombasa (2016 Kennerspiel Des Jahres Nominee), and Port Royal. With a track record of creating award winning games I was excited to try out Oh My Goods! as like the other games I mentioned it is well regarded. There is also the fact that I have always liked city-building economic games. Oh My Goods! may not be perfect but it does a fantastic job streamlining a complicated economic game into a quick simple card game. How to Play Oh My Goods! Each player randomly chooses one of the Charburner and Worker cards. The Charburner and Worker cards not taken are returned to the box. Randomly place a number of assistant cards out on the table (randomizing which side is placed face up) depending on the number of players. The assistant cards that aren’t used are placed back in the box. The remaining cards are shuffled. Each player is dealt five cards. Additionally seven cards are placed horizontally across the top of each player’s Charburner card. The rest of the cards form the draw pile. The player who most recently worked the hardest is the active player in the first round. Oh My Goods! is played in rounds. In each round there are four different phases that all of the players will complete before moving onto the next phase. Each round begins with the active player dealing two cards from the draw pile to each player. If the draw pile ever runs out of cards, the discard pile is shuffled and becomes the new draw pile. If there are no cards in the draw or discard pile, all of the players will discard half their hand to form a new draw pile. The sunrise phase begins with the active player taking cards from the draw pile and placing them face up in the middle of the table. These cards form the “market display” which belongs to all of the players. The player will keep drawing cards until there are two cards in the market display that show a “half sun”. These five cards were added to the market display. As two half suns were drawn, the player adds no additional cards. All of the players will then make two decisions. First all of the players decide whether they would like to build the building on one of the cards in their hand in phase four. In order to build a building, the player has to pay the cost in the top left corner of the card. If a player chooses to build a building, they will place the card face down on the table. The player can only build one building each round, but could also chose to build no buildings. All of the players will also have to decide which building they want their worker and any assistants they acquired to work at. Your worker can move freely between buildings. To move an assistant to a different building, you will have to pay two gold. When placing your worker card you will have to decide whether you want to place them orderly or sloppily (more on this in Phase 4). Only one worker or assistant may be placed on each building. This player has decided to place their worker on their Charburner. They have chosen to have them work orderly. In the sunset phase the active player will add more cards to the market display. They will take cards from the draw pile and place them face up next to the cards from the sunrise phase. Once two more half sun cards are drawn, the sunset phase ends. At the end of the sunset phase three additional cards were added to the market display. In this phase of the game players take turns starting with the active player and moving clockwise. A player looks at all of their building cards that have a worker or an assistant on them. 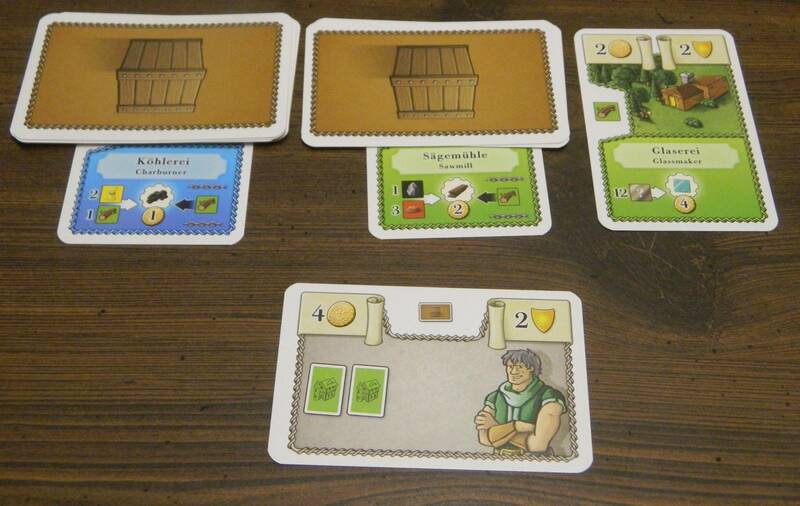 For a building to produce goods the player will need all of the goods shown on the bottom left side of the card. All of the cards in the market display count towards these requirements. All of the players get to use all of the cards in the market display as they are not “used up” by any of the players. A card’s resource is pictured on the left side of the card. If all of the needed resources aren’t in the market display, the player can play cards from their hand for their resource. Resources received from discarded cards only apply to one building. Once they are used for their resource, these cards are discarded. If a player chose for their worker to work sloppily, they can ignore one of the resource requirements and still produce goods. If the worker is working orderly, the player needs all of the resources on the right side of the card. If a player has access to all of the needed resources for a building, the building will produce resources. If a worker worked orderly, they will produce two of the good. If the worker worked sloppily or an assistant worked at the building, the building will produce one of the good. To indicate that a good was produced the player will take the appropriate number of cards from the draw pile and place them face down sideways on the appropriate building. These cards represent the good that the building produces and are worth coins equal to the number in the circle under the picture of the item. This player has chosen to have their worker work orderly at the Charburner. Therefore they will need two wheat and one wood in order to produce goods. The market display has one wood but only has one wheat. This player will have to play a wheat card from their hand (shown in the bottom left) in order to produce goods. If they play the wheat card they will add two cards face down to the Charburner to indicate two goods being produced. If a player does not have all of the required resources for a building, that building produces no goods this round. After a building has produced goods, there is an opportunity to use the building’s production chain in order to produce more of the good. 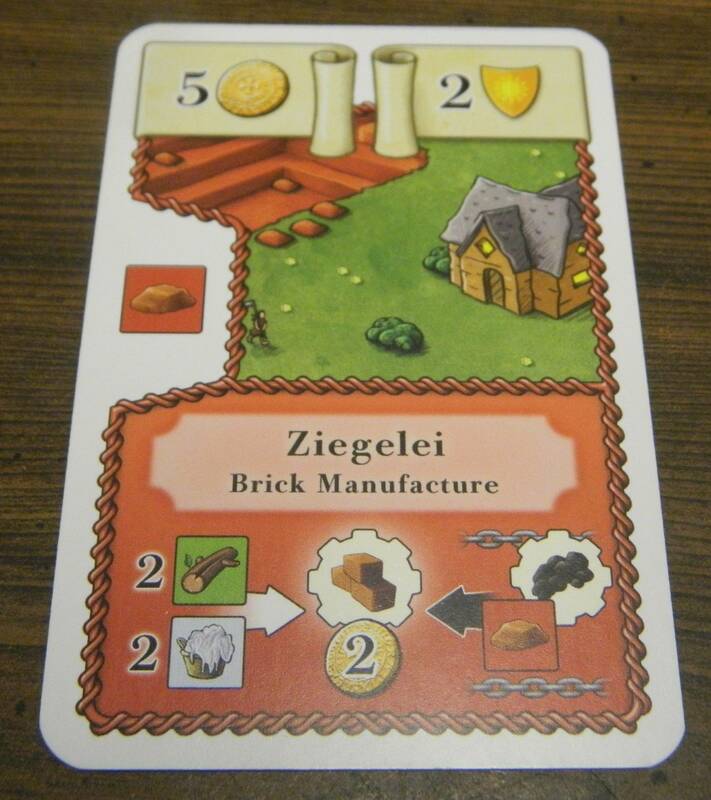 For each building that produced goods, look at the bottom right corner of the card. 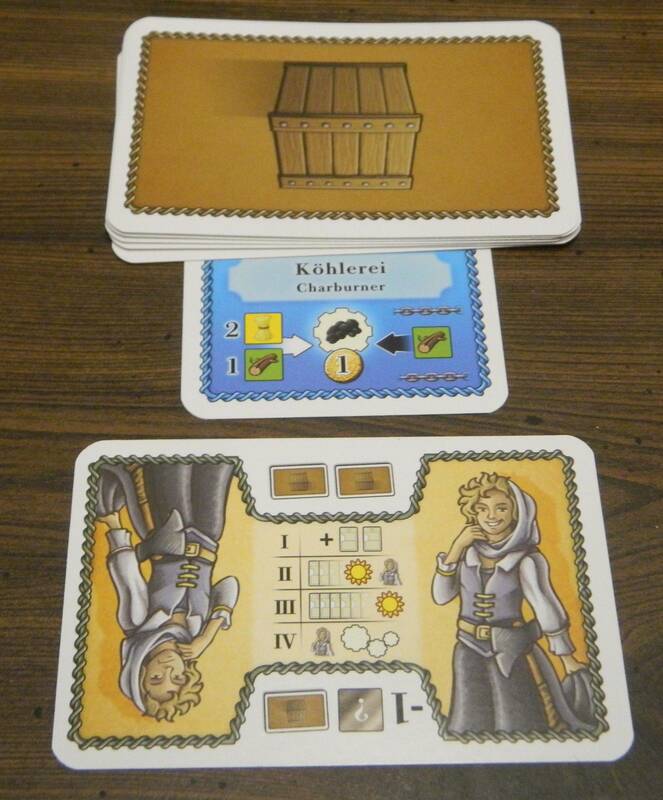 If the player has the resources pictured in their hand or on other buildings (the face down sideways cards) they can discard them in order to produce more of the good. For each set of the cards they discard, the player can add another card face down to the building to indicate another of the good being produced. This building has already produced goods this turn. 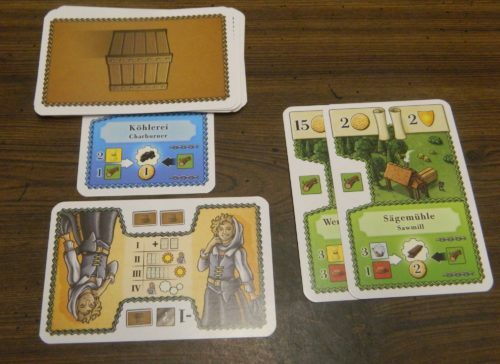 On the right side of the card, it shows that the player is able to play a wood card from their hand to produce another of the good. This player had two wood cards in their hand so they were able to produce two more goods. Next if the player placed a building card face down in phase 2, they have the opportunity to build it. If they choose not the build the building, they will just discard the card. To build the building the player will have to discard good cards from their buildings equal to the value of the building they are trying to build. If the player does not have exact change, they will lose any excess value that they discard. In order to build this building the player will have to discard goods cards with a value of at least five coins. The player then has the opportunity to hire an assistant. The player has to meet two requirements in order to hire an assistant. First the player has to pay the cost in the top left corner. The player also has to have colored buildings in front of them that match the buildings on the bottom of the assistant card. Each player may only acquire two assistants during the game. Once an assistant is acquired they are immediately placed on one of the player’s buildings. 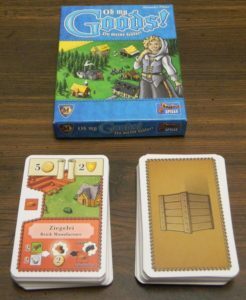 This player has acquired two green buildings so they can purchase the assistant for four coins. Phase four ends with all of the cards in the market display being discarded after everyone has completed their turn. The player to the left of the active player becomes the active player in the next round. Once a player acquires eight buildings (which includes the Charburner) the game enters the end game. The current round is finished and then one additional round is played. Once that round is complete, the game ends. All of the players will total up how many victory points they acquired in the game. Each building that was built and each assistant hired is worth victory points equal to the number in the top right corner. The players will then cash in the points from the goods that are on their buildings. One victory point is awarded for each five coins (rounded down) that their goods are worth. The player who acquired the most victory points wins the game. If there is a tie, the tied player with the most coins remaining that weren’t turned into points wins the game. A player acquired these cards during the game. The player would receive 23 victory points from these cards. 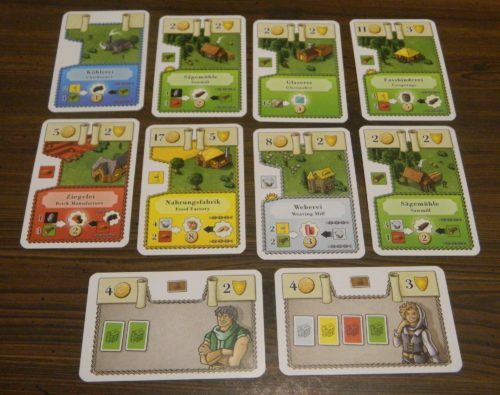 The player would also score some victory points from their produced goods that they hadn’t used to purchase cards (not shown here). When a player builds this building, it will act like there is another wood resource in the market display. 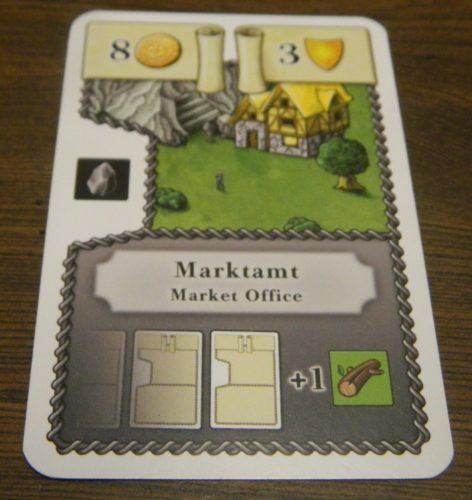 Market Office: The market office provides one of the good pictured on the bottom to the player who built the building. This resource counts as if it was in the market display. If a player adds this building they will get to draw three cards at the beginning of each round. Market Office: In phase one the player will receive one additional card. 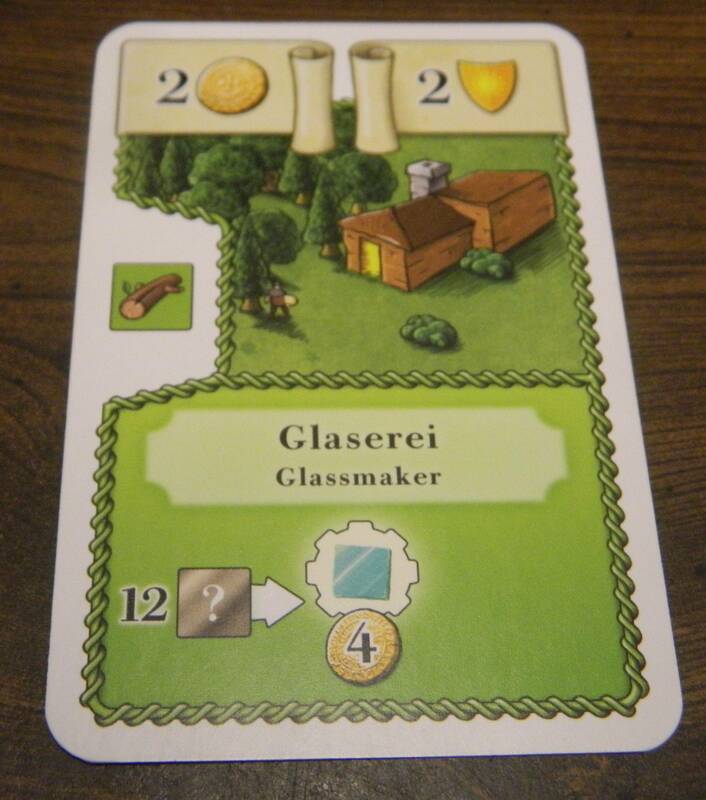 To produce glass this card requires a total of twelve resources. Glassmaker: To produce goods at the glassmaker, the player has to have resources (of any type) equal to the number in the bottom left side of the card. My Thoughts on Oh My Goods! In Oh My Goods! each player takes control over their own city. Each round all of the players are given a group of resources that they will share. These resources are used along with the buildings each player controls in order to produce goods which add value to a player’s city. Each resource you produce is worth money which you can then use in order to purchase additional buildings or hire assistants to help you produce more goods. The goal of the game is to create a set of buildings that can best utilize the resources you are given to make the most money/victory points. 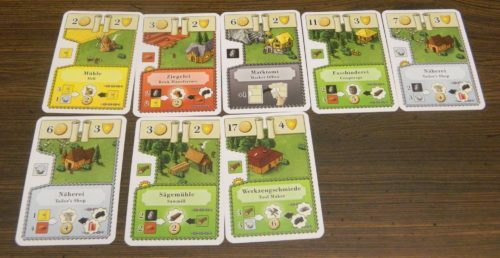 While city building and economic games can be pretty popular, one thing that turns off some people is the fact that the genre can be quite complicated at times. That is not really the case in Oh My Goods!. At first the game might be a little intimidating to people who don’t play a lot of card/board games. Once you start playing Oh My Goods! it becomes clear that the game is quite straightforward. Players have to make a couple decisions each round, but after a couple rounds these become pretty straightforward. Younger children will probably have some troubles understanding all of the rules. Older children and adults shouldn’t have many issues after a couple rounds though. I could even see the game working surprisingly well with people that don’t play a lot of board/card games. Oh My Goods! streamlines the genre quite a bit, but it still has quite a bit of strategy as well. There are meaningful decisions in the game. Your decisions will have an impact on your fate in the game. If you make bad decisions you are going to have a hard time winning the game. Most of these decisions involve choosing which buildings you want to build and which buildings you want produce at. While you could win by randomly adding buildings and producing goods, you increase your odds significantly with a good strategy. In particular it is beneficial to try to create a supply chain of goods which can then be upgraded into even more valuable goods. The reason why I like the strategy aspect of Oh My Goods! is that there are different strategies you can pursue in the game. The game seems to have two main strategies with some variations in-between. On one end you can try to quickly build up your city and end the game. You can build a bunch of lower value buildings which allows you to quickly produce goods and hire assistants quicker. 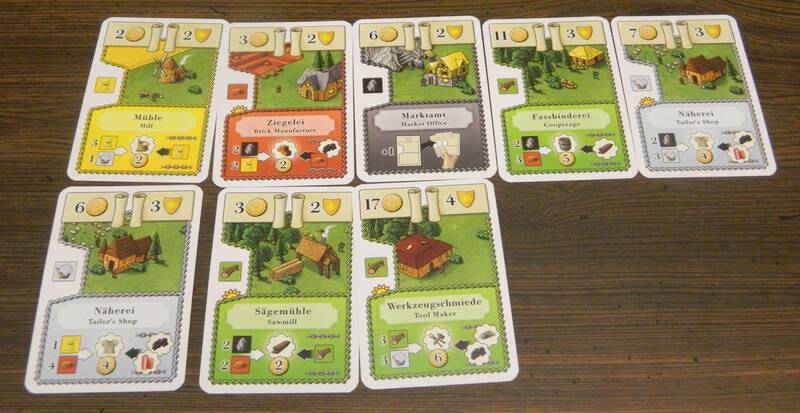 In this strategy you score points by producing from several buildings each turn. You then use that money to add more buildings as you race to end the game before the other players can catch up. The other strategy involves building a chain of buildings. In this strategy you try to add buildings that take resources from another building that you already have. This allows you to produce goods in the first building which can then be upgraded through the production chain of the second building to create a more valuable good. If you can get this strategy to move smoothly, it can create a lot of coins quickly. This strategy does require more time to build up to though. You also need the market display to give you the resources you need in order to be successful . While most of the game relies on building a supply chain to provide the needed resources to produce goods, there is also an interesting press your luck mechanic in the game. The press your luck mechanic comes from the fact that you only get to see around half of the cards for the round before you have to make your decisions for the rest of the round. If you get all of the resources you need for your desired building in the first set of cards, your decision is simple. Most of the time though you won’t get all of the resources you need right away. At this point you need to decide whether you want to play it safe or take a risk. There are actually two different ways you can take a risk in Oh My Goods!. First you can decide to have your worker or one of your assistants work at a higher level building. These buildings produce more valuable goods but they also require more resources and thus are harder to produce at. The other area where you can take a risk is whether you want your worker to work sloppily or orderly. Working sloppily makes it much easier to produce at a building as you can ignore one of the symbols on the building. If you choose to work orderly though your worker could produce twice as many goods. To reduce some of the risk you could sacrifice some of the cards from your hand in order to make sure you can produce at one of your buildings. You will then have less cards to work with than your opponent(s) though. Choosing whether to play it safe or take a risk can be the difference between winning or losing the game. While I really enjoyed Oh My Goods!, I did have a couple issues with the game. I would say that the biggest problem that I had with the game is that it relies on a little more luck than I would like. I don’t mind a decent amount of luck in a card game as games that have no luck can get repetitive pretty quickly. While strategy still plays a big role in your success in Oh My Goods!, there are times where luck will be the deciding factor in who ultimately wins the game. The biggest area where luck comes into play is with what cards get added to the market display. Players have no impact over which cards and how many get added to the market display each round. As players are reliant on getting certain resources in order to produce goods, if you don’t get those resources you are going to have a hard time doing well in the game. I like that you can play cards from your hand in order to offset the cards that you didn’t get in the market display. The problem is that you might not have been dealt the cards that you need either. Thus you might not be able to produce anything at your buildings which will really set you back. Even if you are able to discard the necessary cards, you will still be at a disadvantage compared to the other players as they will have access to more cards. 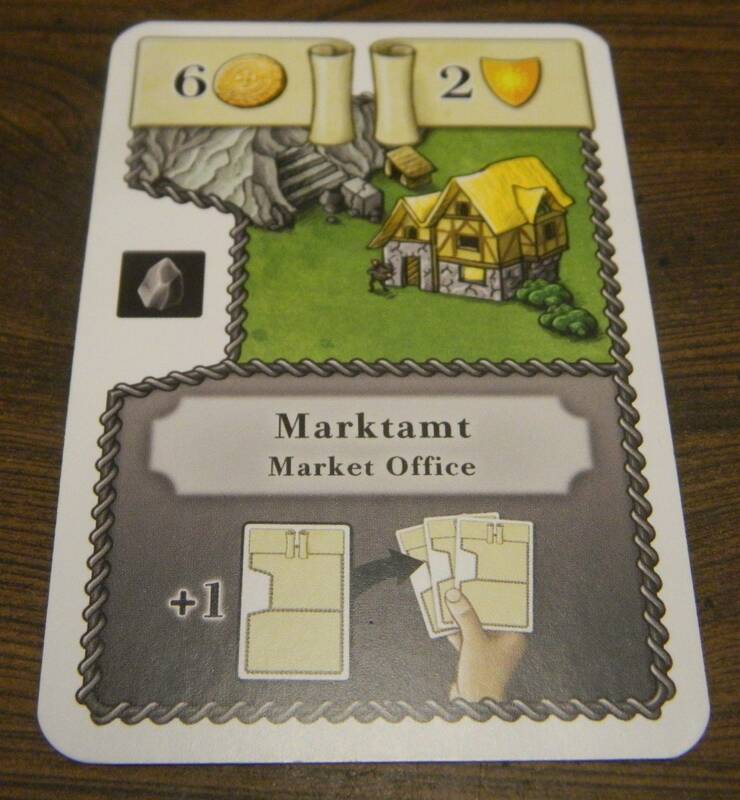 Basically you need synergy between the buildings you choose to work at and the cards that get added to the market display. If you are unlucky in this area you are going to have a hard time winning the game no matter how good your strategy is. Another area where luck comes into play is that I think some cards are quite a bit better than others. In particular the market office cards can be really powerful. They don’t produce any goods that earn you money, but they make it much easier to produce goods in your other buildings. 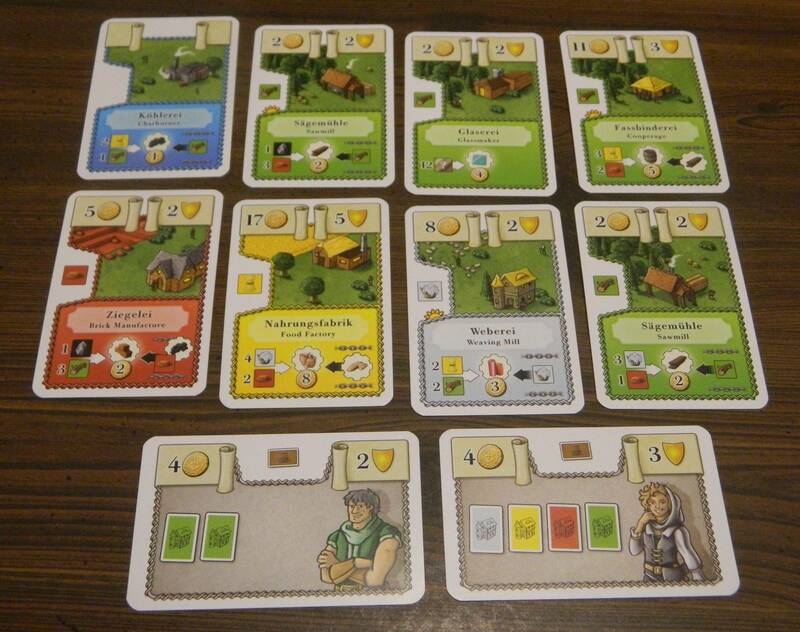 Having a guarantee that you will have certain resources every turn makes producing goods really easy. If you are able to acquire multiple market office cards, you can fulfill the requirements of a building card solely though market office cards. This guarantees you goods from that building every turn. Other than the market office cards, a lot of the other cards are pretty balanced. You probably want to be dealt cheaper buildings earlier in the game and more expensive cards later in the game though. I would say that the second biggest problem with Oh My Goods! is that there isn’t a lot of player interaction between the players. As a matter of fact the only time there is any player interaction is when hiring assistants. If two players are trying to hire the same assistant, there is some interaction over which player can hire the assistant first. Otherwise all of the players are basically playing their own game and then comparing their scores at the end of the game. On the positive side this means that the player count doesn’t really matter as playing with two or four players is not going to have much impact on the game. There are even rules to play the game solo, and while I haven’t tried them I think they could work really well. If you don’t really care all that much about player interaction, this isn’t a huge problem. If you like games with a lot of player interaction though, this is going to be a problem. The third small issue I had with Oh My Goods! is that the game is a little on the short side. 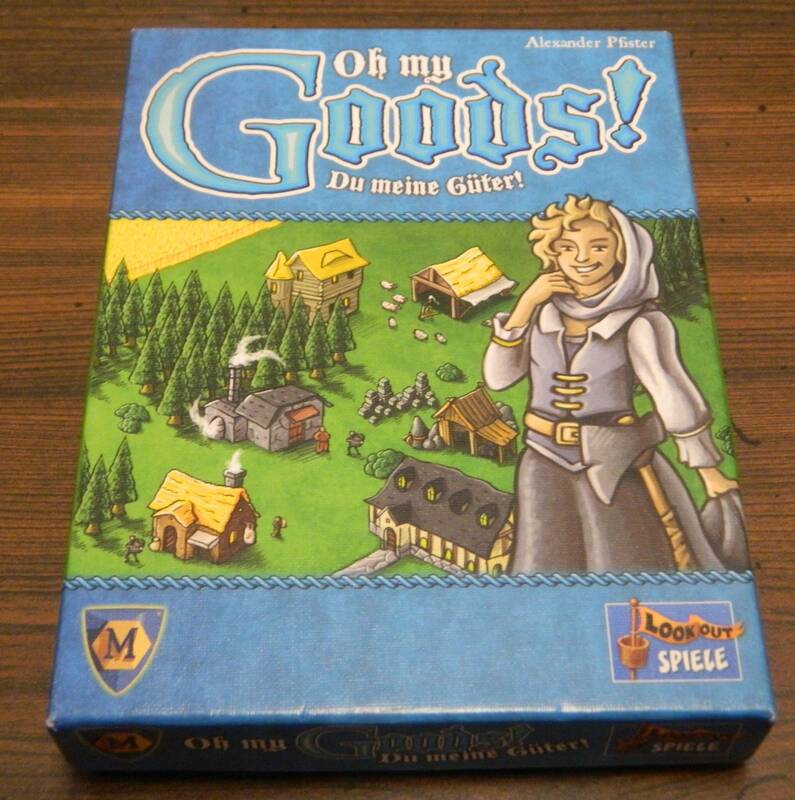 Other than your first game where you are learning how to play the game, I would expect most games of Oh My Goods! to only take around 30 minutes. In theory I like the idea that the game only takes around 30 minutes. When playing the game though it feels like the game ends too quickly. At the point where you have created a good setup and things are starting to move smoothly, the game ends. You spend most of the game building up your city and then the game ends before you are really able to take advantage of it. I think the game would have benefited from being a couple rounds longer. I would maybe suggest playing until someone has built ten or so buildings. The final small issue I had with Oh My Goods! is that at times the game feels like it has a runaway leader issue. If a player is able to get out to an early lead, it is pretty easy to build on that success. If you are able to earn a lot of money early in the game you can use it to purchase more buildings and hire assistants. These in turn can help you generate more goods and make more money. A player that gets out to a lead can easily just build on that lead. The only reason this isn’t a bigger issue is that despite a player being able to build on their lead, the game’s final score still seems to be pretty close. Even in a game where one player seems to be dominating, they still will usually only win by a couple points. Therefore most of the players should be in the game until the very end. The components for Oh My Goods! are pretty much what you would expect from a card game. I will admit that I was a little surprised that Oh My Goods! only includes cards as most economic games have some sort of currency. The game is actually quite clever in how it uses the cards to represent goods which in turn represents money in the game. The card quality is pretty good as the cards are pretty thick. What I really liked about the cards is that the artwork is really good. The cards are also designed in a way where you can easily find whatever information you need, and the cards are even language independent as they utilize symbols instead of words. Should You Buy Oh My Goods!? I had pretty high expectations headed into playing Oh My Goods! and I wasn’t disappointed. Oh My Goods! is basically what you would get if you took your typical economic/city building game and turned it into a card game. 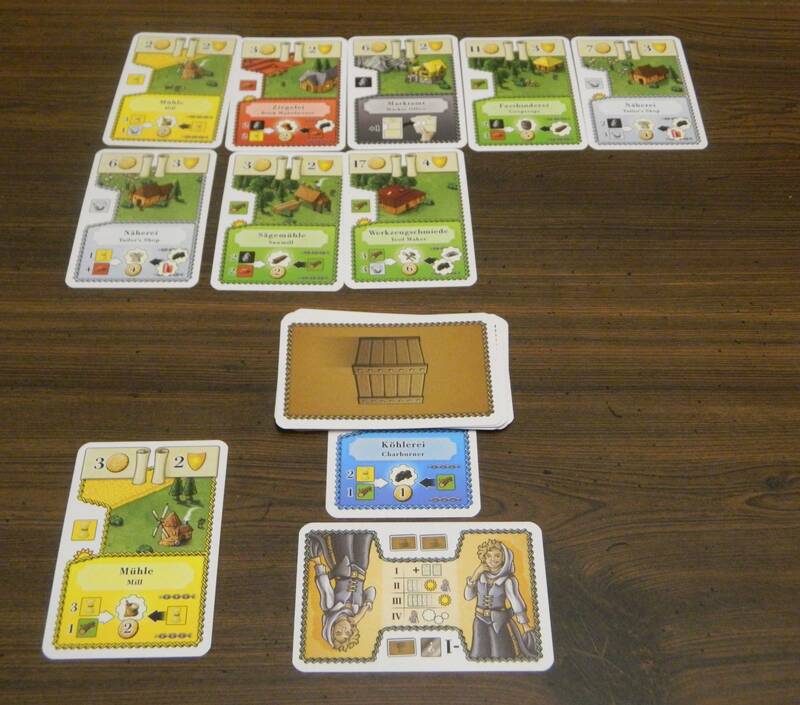 The basic premise of the game is that you use the resources provided each round to produce goods. These goods are then used to buy more buildings which produce even more goods. At first the game might look complicated but it is actually quite easy to play. There is still quite a bit of strategy to the game as your decisions make a difference in the game’s outcome. Oh My Goods! even has an interesting press your luck mechanic. The game is not perfect though as it sometimes relies on too much luck, there is lack of player interaction, the game could have been a little longer, and there is a chance that there will be a runaway leader. If you don’t really care for city builders/economic games, Oh My Goods! is probably not going to be for you. People who think the game’s concept looks interesting though should enjoy their time with Oh My Goods!. I would recommend that they look into picking up Oh My Goods!. Does a great job streamlining city building/economic games. Is a lot easier to play than you would initially expect and still has quite a bit of strategy. Your fate in the game relies on a decent amount of card draw luck. There isn't a lot of player interaction in the game.